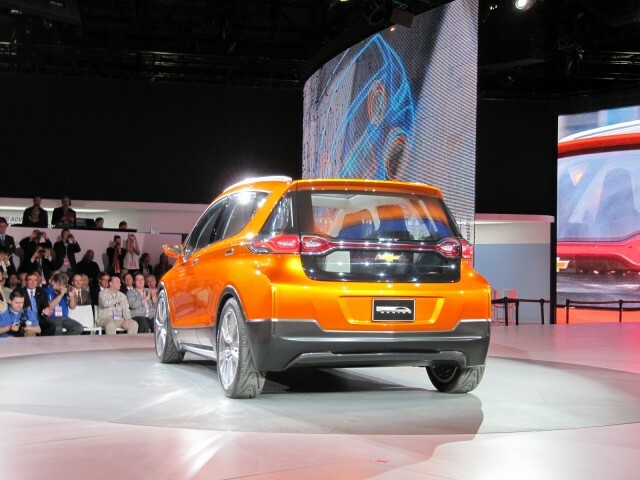 General Motors CEO Mary Barra had hoped to have a Steve Jobs moment this morning, but news about the Chevrolet Bolt Concept for a 200-mile electric car leaked late Friday night. 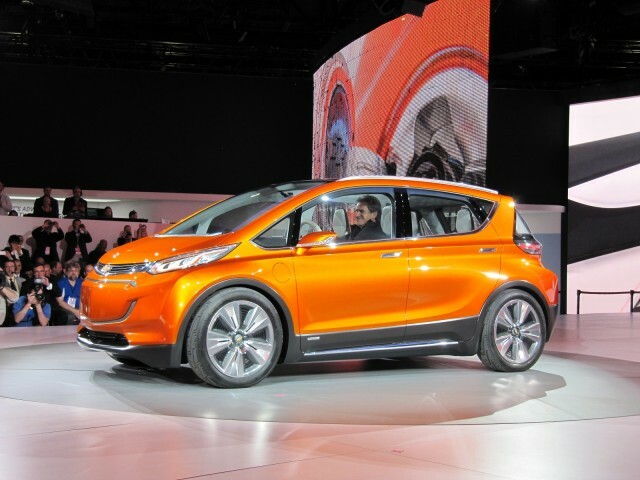 Still, with no advance information, the Bolt Concept was both a surprise to open the Detroit Auto Show and a bold statement by GM about its future of plug-in electric cars. The tall subcompact battery-electric car is a concept vehicle that previews an actual production car that will launch during 2017, likely as a 2018 model. Barra emphasized that the price would be around $30,000, which a GM presentation slide clarified though it remains unclear whether that is after a $7,500 Federal income-tax credit. The bronze concept with a black see-through glass roof was the first attraction of this year's Detroit show, and one of few green, fuel-efficient, or electric vehicles. In shape, it reminded many attendees of the BMW i3, though without that vehicle's unusual dipped window line or blue accent trim. It also has four actual doors, unlike the i3's much-criticized second carriage doors that require the front doors to be opened before rear-seat passengers can exit. Frontal styling has an oblong panel outlined by a light tube, with a thin silver "grille" just tall enough for the Chevrolet bowtie. 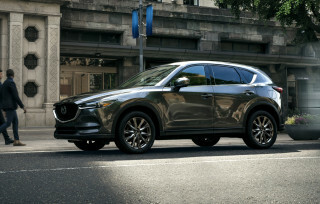 Executives at the post-show scrum gave no indication of the specifications of the battery pack, electric motor, or efficiency rating. 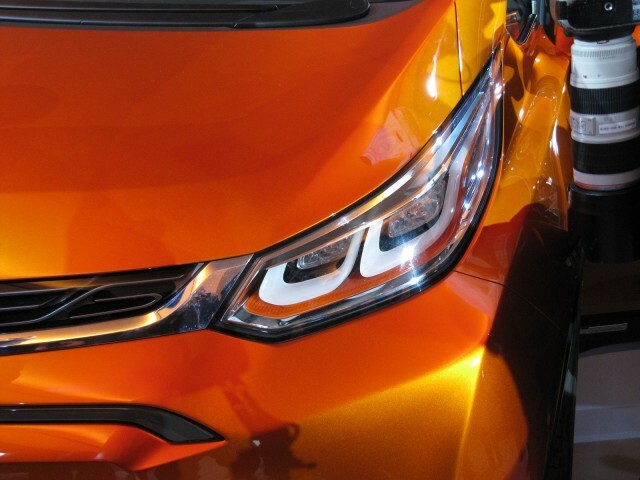 The Chevy Bolt concept was the second of two Chevrolet vehicles revealed in Detroit. 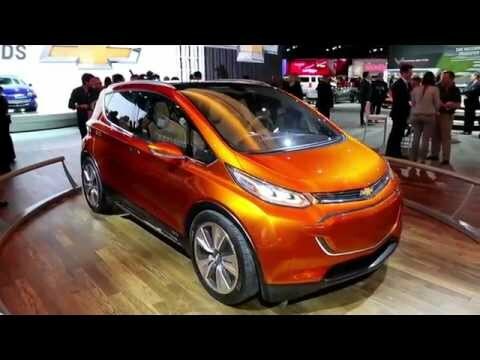 The first was the all-new 2016 Chevrolet Volt plug-in hybrid, which will go on sale in the second half of this year. For all the latest information from tomorrow's events, see our Detroit Auto Show News page.